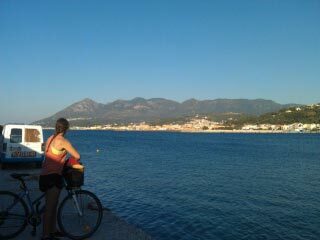 Ode on a Grecian island: looking across to Karlovassi during a bicycle trip. Picture a Greek island in July. The ferry has been delayed due to high winds. We board a bus across Samos Island to our bike rendezvous gazing upon spectacular turquoise sea, olive groves and villages; but also a frightening scene. We had moments of “we can’t ride bikes on these roads. It’s too dangerous – narrow, busy and very hilly”. We talked with the locals. “This is the worst and busiest road on the island. From here on your only worry will be the wind”. Before we left Australia we weighed up two options: by car? by bicycle? For our brief six-day sojourn the dollar costs to hire each was about the same. The decision was easy – travel by car can be too fast, too much sitting, too testing on the nerves and patience. Also, upon the return home, the waistline tells its own story. Wind and roads notwithstanding, Samos Outdoors had already delivered our beautiful 28 inch wheeled machines with a lock, two spare tubes, a pump, fantastic contoured map and a local SIM card for our phone. No turning back now. We had a solid rear rack and a sturdy front basket between us. Backpacks adorned our backs for the bigger journeys between key destinations. Day 2 perched on our two wheels we slowly climbed to 700 metres. Eyeballing the pilot approaching the nearby airport we looked beyond to the plains then the Mediterranean Sea. In the folded hills around us were small villages of tight lanes, red tiled roofs, iridescent blue church domes and citrus and olive orchards. The connecting roads were wide, good surface and not many cars. It was hot. But there was plenty of water. Water comes to Samos from the Turkish Mountains and is pushed up into springs flowing naturally from tapped outlets in all the villages. The experience for the next five days included siestas under the olive trees, eating fresh tomatoes, eggplants, cucumbers and melons; savoring fresh cheese, olives, with herbs collected from the roadside. We stopped for photographs any time we liked, listened to the herd person and his livestock down in the valley….. and shared down time with the locals in the tavernas or coffee shops in the town squares or beachside. By bike we were immersed in the landscape, slowly absorbing the people, the culture and celebrating being alive. Try it some day. I think you’ll like it too. This entry was posted in Locations and tagged Greece, Ros Woodburn, travel by scratchpaper. Bookmark the permalink.